Watch this episode to see how a plain, featureless backyard is turned into a stunning outdoor kitchen. Sometimes an outdoor kitchen is really just a grill with a countertop, but not this project! It is a full featured outdoor kitchen with a beautiful built-in grill, a side burner, kegerator, a bar, a fire pit built in to the counter, plus tons of other features. 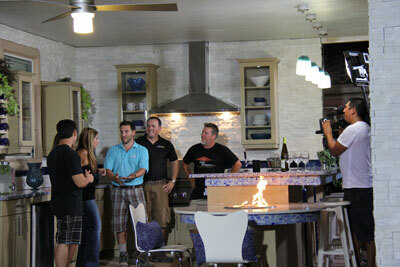 Be sure to watch this episode of Kitchen Crashers to get ideas for your own back yard. See more pictures of this Kitchen Crashers Outdoor Cabinets show.